The Church of Stavros tou Agiasmati, founded and painted in 1494, is a single-aisled building with a steep-pitched timber roof covered with flat tiles. It is located northwest of the village of Platanistasa in Pitsilia. The interior of the church, including the tie beams that support the wooden roof, is completely painted. These frescoes are of particular interest since they represent a mixture of Palaiologan and local native art, blended with Italian Renaissance influences. The painter was Philippos Goul, a Hellenized Syrian Orthodox with good education. Even though his mastery of each style is different, the general impression is pleasant and sometimes quite impressive. In his representation of the Nativity of Christ, he enriched each relevant scene with new items. The Magi are depicted twice, climbing the rocky hill and offering gifts to the newborn Christ. The Cypriot folk painter Parthenios (1790(?)-1848(?)) left an exuberantly plentiful amount of work, especially in the Paphos region of Cyprus, in both mobile icons and frescoes. 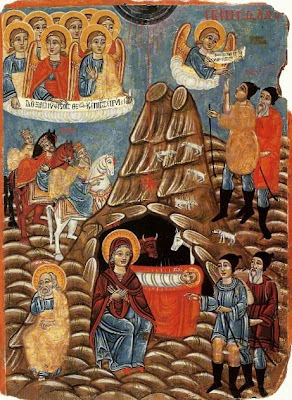 In the Monastery of Panagia Chrysorrogiatissa he executed the frescoes in the blind arches above the entrance of the main church, as well as a representation of the Nativity of Christ in the apse of the Prothesis (1790). 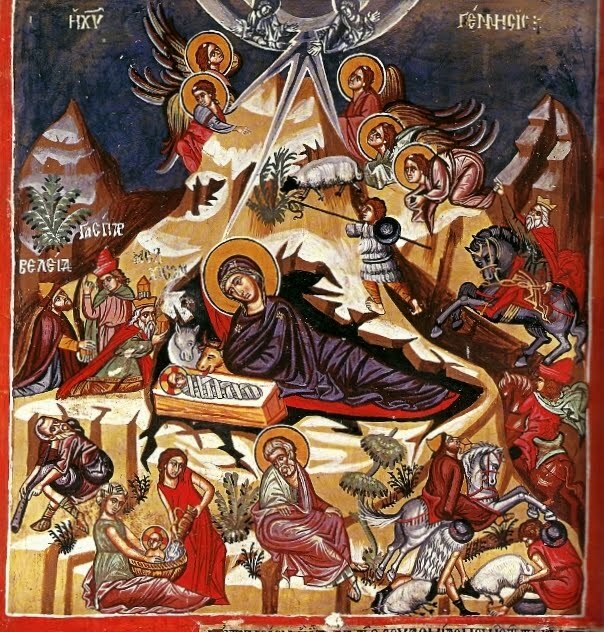 He also painted the icon of the Nativity of Christ with the Veneration of the Shepherds, who are depicted twice.